In Madha, Pawar starts as a firm favourite. The constituency, which was only carved out post-delimitation in 2008, has remained loyal to the NCP, although its voter base has been on the decline. After a 10-year hiatus, Nationalist Congress Party (NCP) president Sharad Pawar has entered the Lok Sabha election ring again. And for his comeback bid, Pawar, 78, has opted for the Madha parliamentary seat in Western Maharashtra, which he had convincingly won the last time he contested, in 2009. According to NCP sources, the move signals a bid by Pawar to position himself as a consensus choice for the country’s top job should the Lok Sabha elections throw a hung verdict, and neither the Congress nor the BJP is in a position to have their own prime ministerial candidate. In Madha, Pawar starts as a firm favourite. The constituency, which was only carved out post-delimitation in 2008, has remained loyal to the NCP, although its voter base has been on the decline. In 2009, Pawar had bagged 5.31 lakh of 9.19 lakh votes polled, defeating the BJP’s Subhash Deshmukh by over 3.14 lakh votes. Deshmukh, a cooperative industry baron, is now Maharashtra’s Cooperation Minister. However, in 2014, when former deputy chief minister and local heavyweight Vijaysinh Mohite-Patil fought from Madha on an NCP ticket, the party’s victory margin dropped to just 25,344 votes. Still, Madha was one of the only four Lok Sabha seats won by the NCP in the Modi-wave election, in which the NDA won 42 of the 48 seats. 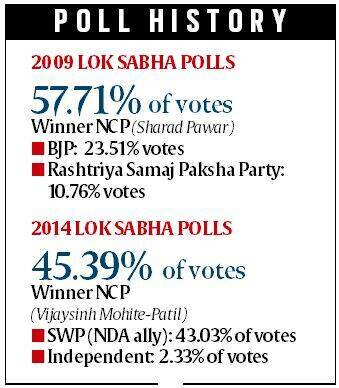 In the 2009 Lok Sabha polls, the NCP’s Maharashtra tally had been eight seats. Come 2019, Pawar’s biggest challenge won’t be the BJP or other rivals, but infighting. To some measure, the Pawar clan itself is to blame. The Pawars and the Mohite-Patil family have had a chequered history. Before the formation of the NCP, Vijaysinh Mohite-Patil was part of the group owing allegiance to former Maharashtra chief minister Vasantdada Patil. After Vasantdada’s death in 1987, Mohite-Patil shifted towards Pawar, and left the Congress with Pawar when he formed the NCP in 1999. However, soon there was a power tussle, with Pawar’s nephew Ajit seen as promoting Pawar loyalists MLA Baban Shinde, former ministers Dilip Sopal and Laxmanrao Dhoble, and Prashant Paricharak, among others, at the cost of Mohite-Patil. Dhoble and Paricharak recently joined the BJP. Administratively, the rural constituency is perennially drought-prone, and was declared drought-hit recently too. In 2009, Pawar, then the Union agriculture minister, had promised a “permanent solution” to Madha’s water woes. But little has changed. Party represent two, while the Shiv Sena holds one.